Let me preface this brief review by saying that I have been waiting 4 years to see this and I finally came across a copy to watch. This is quite a strange movie. I didn't know what to expect going in. It starts off with Norman (Feldman) going to a birthday party for his girlfriend's father in a hotel their family owns, which is to be demolished shortly after. 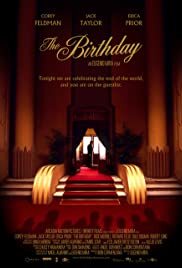 The only guests in the hotel are the group for the birthday party and a group of young men who work for a pharmaceutical company partying upstairs at a different location. The movie starts to transcend into a sci-fi/thriller/horror movie short after. Strange things start to occur. It is told to us through several characters that there is a religious sect in the building who are there to facilitate the birth of a god in their beliefs. Norman is met by a group of men who are trying to stop the sect from letting the god be born and destroy the world. They try to enlist them into their cause by giving him information that will help stop it and team up to find out how and where it is going to happen. What starts out as a normal story descends into cult territory. Without giving up any second half plot points, I'd have to say its a very fun journey to the end of the film. The only actor I know in this film is Feldman, who gives one of his best performances to date. He uses a higher pitch to his voice and sounds like a cross between Peter Falk and Woody Allen as far as accents go. At first it is distracting, but you get used to it and I actually found myself liking that aspect of his character. He has great comedic timing and made me actually care about his character. Although this does not have any distribution in the US (the only version commercially available is from Germany (no idea why), I think this would make a great addition to any cult collection.